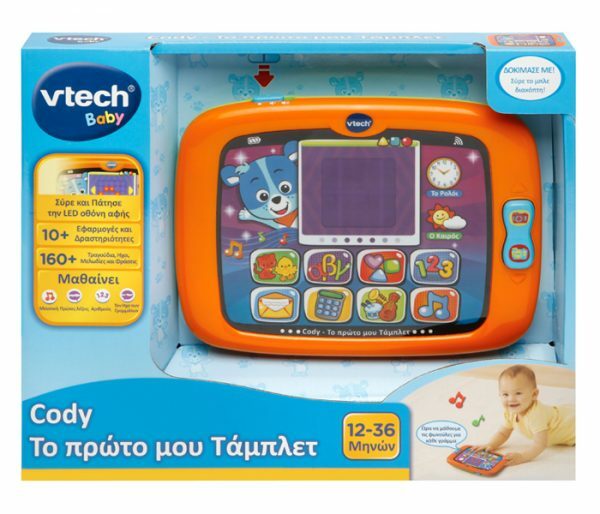 Greek Interactive tablet for preschool children with touch screen and LED! Tap or slide your finger on the tablet’s bright screen. The educational tablet with Cody the smart teddy, promises to bring the child smoothly into the imaginative world of technology. With its various applications (apps) it will help children learn alphabet numbers and more through a variety of themes. Touch or slide your finger on the bright screen as well as the actual tabs to turn it on. It has 10 different buttons that activate “applications” and a zoom button to activate the camera. It teaches voices, numbers, shapes, musical instruments, animals, and teaches the child the meaning of time and time in Greek. Songs in Greek to sing along with your child as well as pleasing melodies.